Orthica Magnesium prescriptions are currently not available via our online consultation service. You can, however, request an online consultation for amnesia. How to use Magnesium by Orthica? Magnesium by Orthica is a dietary supplement in tablet or capsule form which contains high-quality magnesium. Magnesium is a key mineral that supports many body functions, including nerve cell communication, memory and energy metabolism. Orthica Magnesium does not contain gluten, lactose, soy protein, yeast, sucrose or any artificial preservatives, flavourings or colourings. This dietary supplement is suitable for vegetarians. Magnesium is one of the most important minerals in the body, participating in hundreds of essential biochemical reactions, including nerve cell communication and bone and muscle health. Magnesium is known to help both memory and attention, especially as we age. Magnesium deficiency can cause all sorts of physical and psychological problems such as fatigue, irritability, muscle problems, cardiac arrhythmia, cold hands and feet, nervousness, headache and menstrual problems. Magnesium deficiency can be brought on by many things, including an unhealthy diet, prolonged stress or illness. Orthica Magnesium supplements magnesium deficiencies and keeps magnesium levels in balance. 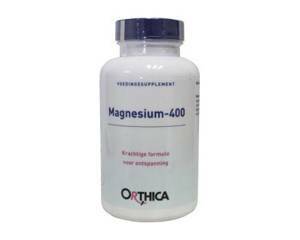 Orthica Magnesium-400: high-dose dietary supplement with calcium, selenium and zinc. Dosage: one tablet a day with or directly after meals. Orthica Magnesium-125: easily breakable capsules which, if necessary, can be opened and the contents dispersed in a spoonful of applesauce or pudding. Ideal for people who have difficulty swallowing. The organically bound magnesium is easily digestible and therefore particularly suitable for the elderly. Dosage: two capsules a day with or directly after meals. Orthica Magnesium-55: small, round, easy-to-swallow tablet. The organically bound magnesium is easily digestible and therefore particularly suitable for the elderly. Dosage: one to four tablets a day with or directly after meals. Orthica Magnesium Plus: combines the positive properties of organically bound magnesium with Ashwagandha extract, a plant known for its stress reducing effect. Both magnesium and Ashwagandha are favourable for a good mental balance and support memory and concentration. Dosage: two capsules a day with or directly after meals. Read the instructions on the package before use. Orthica Magnesium does not cause side effects. If you do experience side effects, consult a doctor. Do not use Orthica Magnesium if you are allergic to any of its ingredients. For a list of ingredients, please consult the package leaflet or information on the package. No variant of Orthica Magnesium should be used by children under 12 years of age, unless otherwise advised by a doctor. Orthica Magnesium Plus should not be used by pregnant or breastfeeding women.